Membership Engagement... IT Solves EVERYTHING! : Why Are You Here and Do You Know Your Vital Signs? Why Are You Here and Do You Know Your Vital Signs? With it being the end of the year, it's typically a time of reflection and a renewed energy towards making the future better. My question to you is, do you know "Why you are here" (your association mission), and "Are you looking at the vital signs that can instantly tell you if you need some type of change"? You see, just as knowing your purpose is a stability for successful people, your association mission is a stability for your association. Your mission provides a confidence to your members that the industry could tumble tomorrow, but you will be OK because you are a member of our association. The question is...do you have the right mission for your membership? One they find great confidence in? Is your mission clear, measurable, achievable, and supports the future picture of your organization and its member's needs? 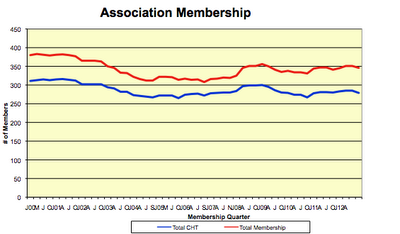 Total Membership - Tells you the health of your membership. This line doesn't have to always be growing, but at least steadily moving upward because you are not in the membership business. You are in the business of doing your purpose, and if done with awesomeness and clarity, non-members will want to convert to supporting members. You can see before the line in the middle, if that is all you saw, you would know instantly you needed to make change because of the downward trend. Our change has provided steady increases towards our previous highs in membership. 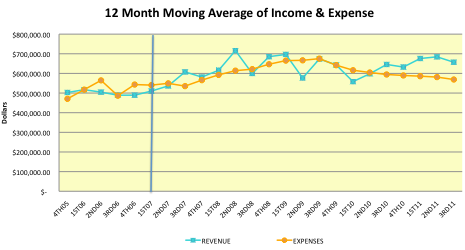 Rolling 12-months of Revenues and Expenses - This helps you to see how the flow of income and expenses are each quarter, so you can quickly judge how your overall decisions are impacting both. You can see that when our per member revenue began to rise, it had a nice impact on our revenues. 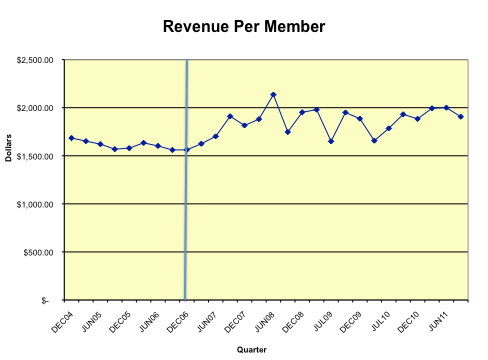 Costs began to rise as meeting participation rose, but seeing that on this graph, we have been able to curb expenses and keep revenues up. The reason a graph is so important is it tells you the relevance of a number at a period in time. The same number can look good or bad depending on if it's on the upswing, or on a downward trend. Graphs make every number clear whether they are good or bad. 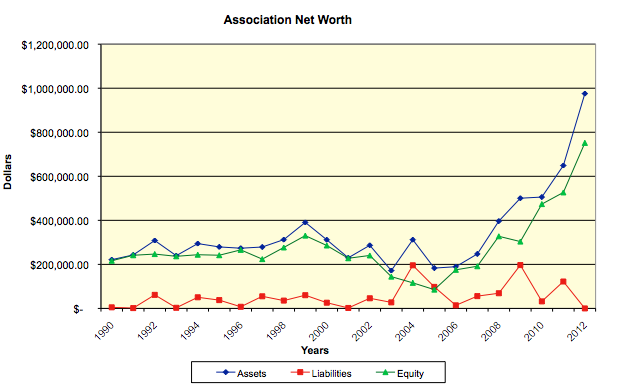 Total Net Member Surplus (Net Worth) - This tells you the overall health of everything. If this number is rising, your overall health is good. If this number is falling, you have a problem because you are dipping into reserves to pay bills. Not a good thing. When you look at this graph, tell me if you and your board were looking only at the graph to the left of the line, don't you think you would start thinking about making some changes...and quick? Some of the same numbers on the right hand side look good because they are on the rise. The same number on the left is bad because it's in the middle of a severe decline. Visualization of your vitals signs are empowering in motivating decision making. The moment these visual images were created in picture format of our 4-key vital signs for this board to look at, making change became easier. No board wants to be the board that drove the association into non-existence. Downward trends in the key vital signs are truly disturbing to any board, because they can now see how their decisions are directly related to the health of the association. Graph out your key vital signs to get the big picture of where you are heading. Establish your mission that is clear, achievable, measurable, and supports the future picture. Create an action plan to achieve your mission, taking into account threats. Have an action item to deal with each controllable threat, and a contingency action item for each uncontrollable threat if it occurs. Make sure to continue to plot out your vital signs to watch the impact of your action plan on the overall success, or need for an "innovation adjustment" to them. Debrief your action plan with your board and staff, and look at your vital signs each quarter to look at where you said you want to be, where you are, and any "innovation adjustments" needed to bridge the gap. The key is to watch your vital signs and make changes as needed. 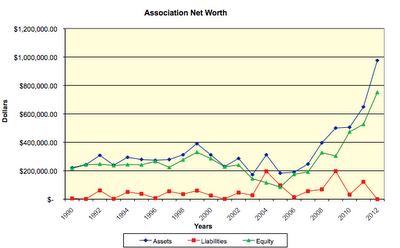 Having an association that rules your industry is not that complicated to obtain. The key is to know your vital signs, know your resources, know your members needs and wants, and match a plan of innovation and action that meets those needs.